This temple is situated in Tamilnadu in Chennai , near Chengleput. Hayagreevar is the God of Education. He gives Dharshan in the ‘Yoga-State’ in Chettipunniam Devanadha Perumal Temple. Students who pray Him can get good marks in the examinations. Before 400 years, in 1848, the statue of Hayagreevar has been brought from Thiruvaheendram near Cuddalore. That statue was erected in Chettipunniam –village in the Tamil month of ‘Vaikasi’ in ‘Maham’ star. Later, the statues of Hemambujavalli, Sreedevi, Poodevi and Andal were formed. The ‘Moolavar’ is called as Varadharajar and the ‘Urchavar’ is called as Devanadhaswami. Education-poojas are specially performed, here. Students, during Exam-time, praying Him and keeping their pen, pencil, books and hall-tickets under His feet get more memory power. Students of 10th and 12th and college students are doing this prayer in more numbers. Parents of the students are also coming and performing these poojas. The photo of Hayagreevar and a pen are sent by post to those who are not able to come in person. Those who are not able to talk freely also come here and honey is applied on their tongue. They get back the capacity to talk. It is better to get prior appointment of the Priest, before going. 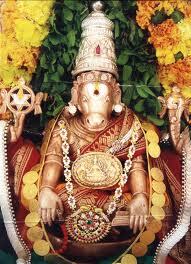 Temple is situated in a village at a distance of 3 km from Singaperumalkoil on the road of Chennai-Chengleput. Temple remains opened from morning 7.30am -12.00; in the evening 4.30pm-night 8.00pm. Contact Mobile-8675127999.